New World Computing (NWC) was founded by Mark Caldwell, Jon Van Caneghem, and his wife Michaela in 1984. Based in California, NWC is best known for the Might and Magic series of role-playing games that began in 1986 and its 1995 strategy spin-off Heroes of Might and Magic. The 3DO Company acquired NWC in 1996 and it continued to publish games as a division of its new parent company. However, as The 3DO Company began struggling financially it laid off a significant number of staff at NWC in 2002 and ceased to exist in 2003. 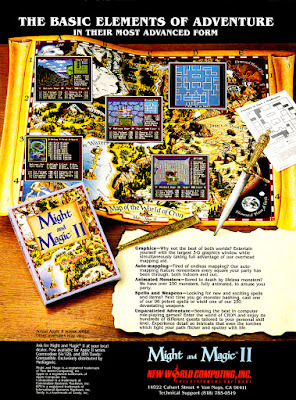 Ubisoft purchased the rights to the Might and Magic series shortly before the closure. Nexoft is one of those companies that I cannot locate much information on. It was based in Cypress, CA and only published a handful of games from 1989 to 1991 for the Nintendo Entertainment System (NES) and Game Boy.